Anti-aging serum that helps prevent loss of collagen, promotes collagen formation, and tightens skin. Contains Matrixyl 3000, along with several other actives. How to use: Apply twice daily. This product is a watery gel and a little goes a long way. Spot treat any lines/wrinkles with a drop or two. You can use more or less as needed. I find that a light coat absorbs better & more quickly. Massage the product on gently & allow it to absorb. For more detailed instructions/info, click here. This product is non-returnable, so please ask any questions prior to purchasing. Ingredients: water, glycerin (and) acrylates copolymer & PVP/polycarbamyl polyglycol ester (and) hydrolyzed sesame protein PG - propyl methylsilanediol, butylene glycol (and) carbomer (and) polysorbate 20 (and) palmitoyl oligopeptide (and) palmitoyl tetrapeptide-7, lycium barbarum (goji) fruit extract, enteromorpha compressa extract (and) caesalpinia spinosa gum, hydroxyethylcellulose, tamarind seed extract, hibiscus extract, propylene glycol (and) diazolidinyl urea (and) iodopropynyl butylcarbamate. Do I need the I'll Get You (Lines), My Pretty!? 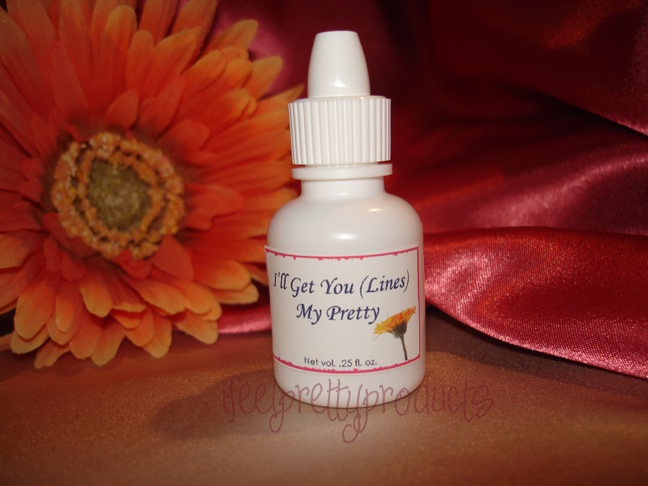 The I'll Get You (Lines), My Pretty! product contains Matrixyl 3000 along with several other actives - which encourage collagen production, help prevent collagen loss, and tighten the skin. It can take up to 1 month to see 'visible' results with the I'll Get You (Lines), My Pretty product.